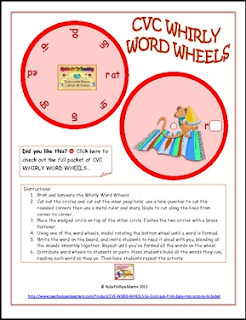 Word Wheels: This is a free sample of my 13 CVC WHIRLY WORD WHEELS which help students to merge the beginning consonant sound to the VC ending in these one-syllable words for beginners who can identify letter sounds but need practice to merge the sounds together to form words. 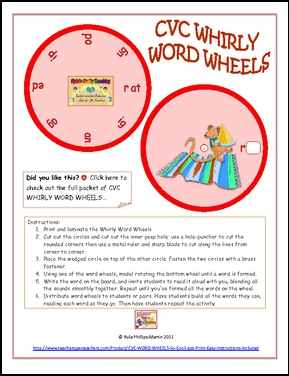 Each word wheel has colorful illustrations of words in the wheel and each wheel uses each of the vowels a,e,i,o and u as the middle sounds. The illustrations and colors chosen are varied to appeal to both boys and girls. Instructions for assembly are included.